Following government threats to begin firing protesting contractual teachers, unions are urging members to continue to take to the streets. A teachers' union rally flag flies in front of the Parliament in Rabat during the first protest this month on April 2. Photo by Stephen Higgins/Morocco World News. Rabat – Her first act of defiance was wearing a red union armband to class. Her second was staging assemblies after school. Now, Imane Ragi, a veteran of more than 25 protests, is entering the third month of a nation-wide contractual teachers’ strike in Morocco. 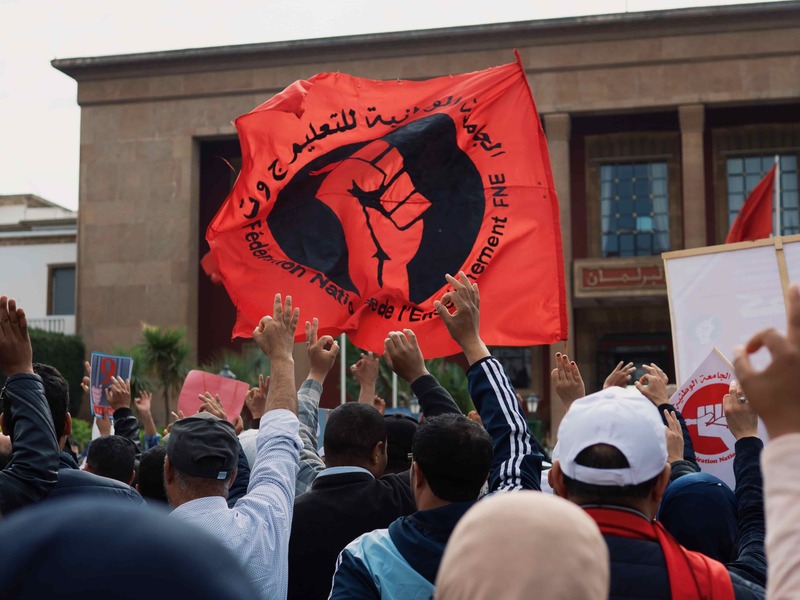 Along with more than 200 other contractual teachers, Ragi chanted, “We are still here and we won’t stop” in front of Parliament in Rabat, the usual location for rallies. This particular protest is the first in April. 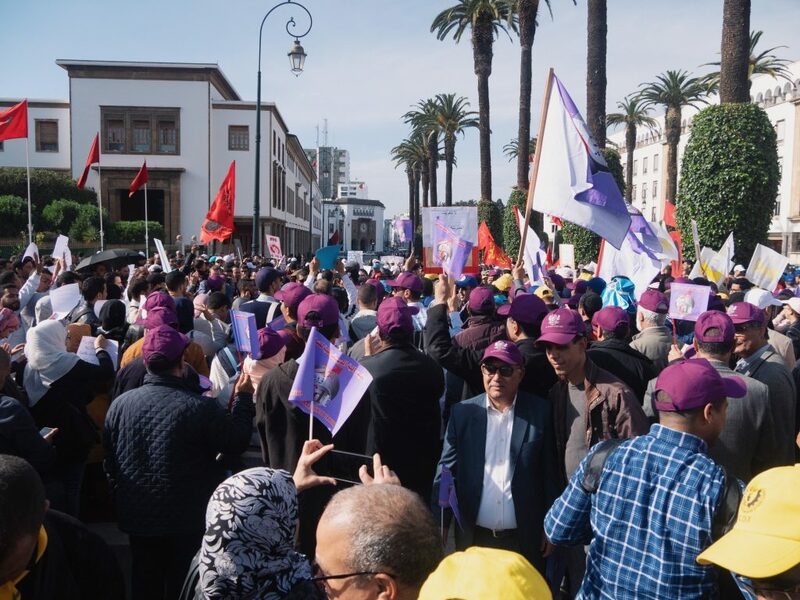 The day before, teachers’ rights unions had sent messages urging their supporters to continue rejecting the Moroccan government’s attempts to end protests and ignore the Ministry of Education’s threats of firing. Ragi was one of the thousands of teachers participating in the overnight protest two weeks ago that ended when the police dispersed the crowd with the use of water cannons. A member of the Democratic Federation of Labour wears his union’s purple hat during the first contractual teachers’ protest this month on April 2. Photo by Stephen Higgins/Morocco World News. The Democratic Labor Confederation’s National Education Union (SNE-CDT), the Democratic Labor Federation’s National Education Union (SNE-FDT), the National Teaching Federation (FNE), the National Federation of Teachers (UNMT) and the Moroccan National Coordination of Teachers Forced into Teaching Contracts (CNPCC) are five of the unions that have been most involved with the contractual teachers’ protests. 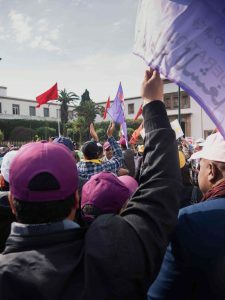 Together the unions have staged protests in several cities across Morocco, including Kenitra, Casablanca, Tetouan, Oujda, Errachidia, and Marrakech. Each union has its own designated color, making the crowd of teachers participating in the first April protest a sea of red, yellow, purple, blue, and white. Before slipping into the crowd of chanting teachers, Ragi adjusted her red union armband—the CNPCC’s color. The core of the movement has two main groups. The first is the contractual teachers. To fill a need for more teachers, the Ministry of Education has been hiring teachers through regional academies under annually renewable contracts since 2016. 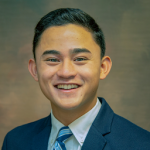 Individuals hired under this contract are known as “contractual teachers.” They are members of the public sector and receive the same salary, starting at MAD 5,000 ($520) a month, as teachers permanently on the government payroll. But their annual contracts include a reduced pension and lead to less job security—the two main reasons many have been protesting. These teachers have been accused by the government of violating their contracts by protesting instead of teaching. 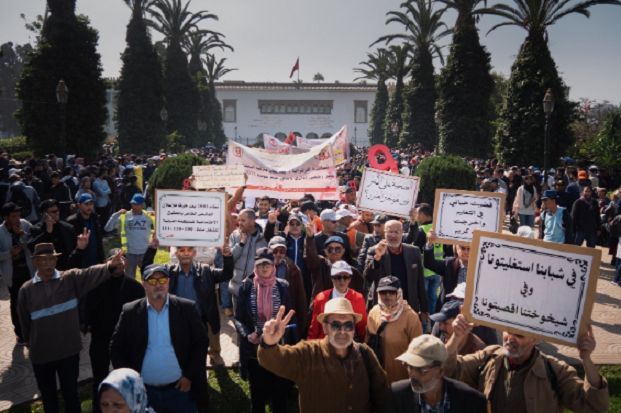 More than 200 demonstrators gathered in front of the Parliament in Rabat during the first contractual teachers’ protest this month on April 2. 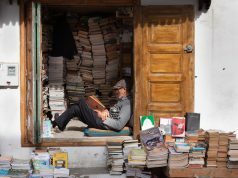 Photo by Stephen Higgins/Morocco World News. Minister of Education Said Amzazi issued a statement in March, explaining that teachers were properly informed of the contracts’ conditions and requested the contractual teachers to return to their classrooms. “We won’t go home until we have our demands realized. We aren’t going to stop until we get what we want and we are integrated into the government,” Khalid Bittaouia, a member of the national CNPCC and coordinator for Sidi Slimane, a city northeast of Rabat, told MWN. Bittaouia has played a pivotal role in organizing and transporting teachers between the two cities, a journey of more than 100 kilometers. 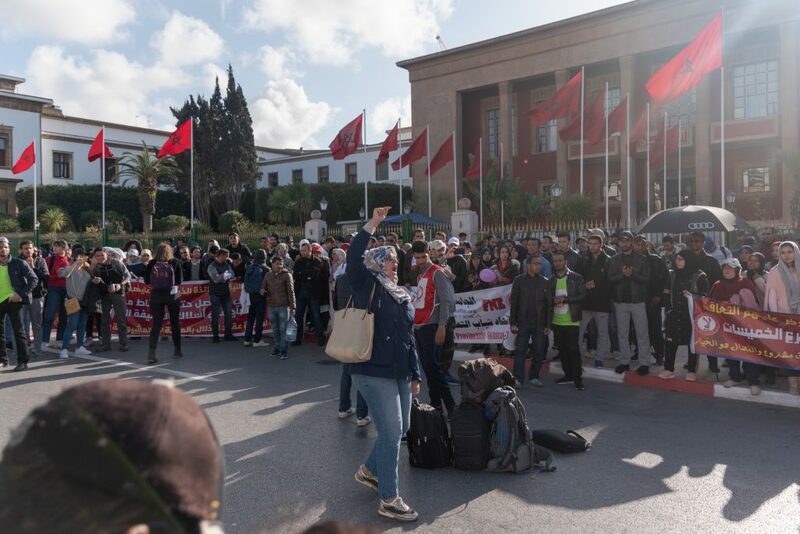 During the March 12 protest, Bittaouia calculated that more than half of Sidi Slimane’s contractual teachers were in attendance—roughly 200 demonstrators. The Cell 9 Coordination is the second group of teachers that form the base of the movement; teachers in this group fall within the government’s ninth pay grade. 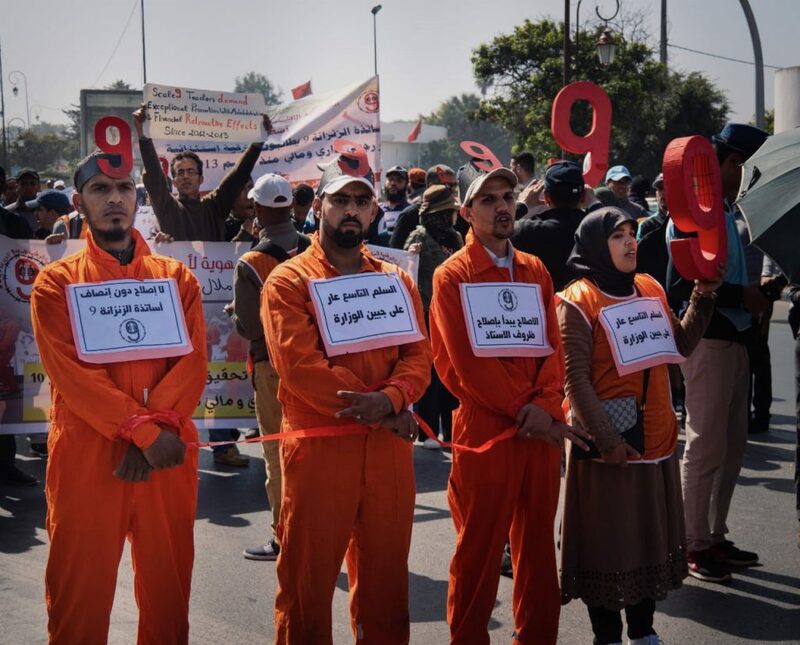 Cell 9 Coordination teachers wear the number nine along with matching orange prison uniforms to illustrate their group’s name during a protest on March 12. Photo by Stephen Higgins/Morocco World News. According to the SNE-CDT, SNE-FDT, and FNE, the government has been withholding promotions to the 10th pay grade. The average difference between the two grades is MAD 1,500 ($155) per month. Every two years, the Ministry of Education is required to offer qualifying exams to evaluate teachers’ performance; the results of the exams determine promotions. But the unions claim the exams are not fairly graded and that many of their teachers have not been promoted since 2012. The group is calling for the immediate promotion of all of its members to the 10th pay grade. Boukhisse declined to give the exact number of teachers within the coordination. But according to the Ministry of Education, there are more than 4,560 teachers within the ninth pay grade nationwide. The Ministry of Education has been steadfast in its refusal to meet all of the teacher unions’ requests. Violence broke out during the first month of the protests on Feb. 18-20. The injuries suffered by teachers caused outrage throughout the unions and inspired protesters to continue into March. The Ministry of Education in Rabat has been where most of the protests have started. On March 12, two days after unions rejected the ministry’s propose reforms, teachers gather for another demonstration. Photo by Stephen Higgins/Morocco World News. On March 10, the Ministry of Education announced potential reforms that would grant contractual teachers all the rights of a permanent teacher but not hire them as public sector employees. The unions rejected the reforms on the same day. Protests continued throughout the month, leading to the outburst of violence on March 23-24, when police used water cannons to disperse an overnight sit-in by Parliament. Days after the incident, Amzazi announced in a press conference on March 27 the government’s plans to begin firing contractual teacher protesters. Following the February violence, teachers continue to protest throughout March. On March 8, a female teacher leads chants during a protest on International Women’s Day. Photo by Chris Dillion. Amzazi assured teachers that if they ended their strikes and returned to work, the government would “provide them with all their needs and guarantee all their rights, except for the deduction of their wages,” which the government still plans to do. It was in response to this announcement and the end of March violence that the unions called for their members to take to the streets and continue protesting.